ACT leader Rodney Hide has told Parliament the Serious Fraud Office is considering a complaint that NZ First leader Winston Peters asked a fishing industry boss for $50,000 to keep quiet about corruption allegations. The claim came amid angry exchanges which saw Mr Hide expelled from the House after a stand-up row with Speaker Margaret Wilson, who said he was breaking Parliament's rules by raising matters before the courts. Mr Peters said Mr Hide was making baseless allegations that were part of a defamation case he has taken against Television New Zealand, Radio New Zealand and others. Speaking under parliamentary privilege, Mr Hide claimed the Serious Fraud Office was assessing a complaint from a former business associate of Peter Simunovich that Mr Peters had gone to Mr Simunovich with evidence of corruption. Mr Hide said the businessman claimed Mr Peters told Mr Simunovich that through a payment of $50,000, the evidence could be slowly got rid of. Mr Hide also claimed a businessman had told Dominion Post reporter Phil Kitchin that he was given $9999.95 to pass to NZ First in exchange for Mr Peters "shutting up about his allegations of wrong-doing against Simunovich Fisheries". Mr Hide said the man's statement and details were provided to the fraud office last week and the man was concerned for his personal safety. The claims are extraordinary, that Winston blackmailed Simunovich Fisheries for $50 000, I just think that Winston would have made it for a lot more than $50 000, why was he aiming so low? Rodney is smart, smart enough to make sure his claims are rock solid and they better be or he’ll find himself crucified but the damage may well have been done, Winston taking money from corporates after raging against them for his entire life is hypercritical, but blackmailing a corporate to hush up evidence is a claim that spells political suicide. The theatre continues today with the extra pressure of the privileges committee and Owen Glenn’s statement on any money he gave Peters, while the cliché is you should never write off Peters, this time I think his fate may well be sealed. Helen needs him to get her ETS through, in conjunction with the soon to be departed Greens (RIP). 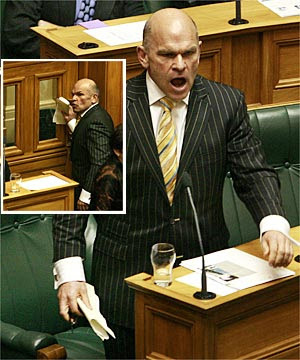 So I would say we will see more of Margaret Wilsons partisan behaviour in the House today. With what else is going to come out this week and next that should not be a problem. Helen's now trying to make a bit of wiggle room but unfortunately for her the image in the public mind is that she backs him so she will be tarred with the same brush. If she hadn't needed him to back her on the ETS he would have been gone a couple of weeks ago. Its the usual story from Labour and Helen - too greedy for their own good. Whats going to be really good is what he'll do once she gives him the boot. The old dog's been around long enough to have one good bite still left in him and Labour will probably be the recipient once they turn on Winston. Now....what could Winston possibly know about Labour(and Helen) that will wreck the Party for many years to come. What dirty deeds have they been up to that the public doesn't know about? I would suggest that it will make the 'secret agenda' and 'looking after your rich mates' memes pale in insignificance. History will show that Labour under Helen took dirty politics to unprecedented heights in NZ. As they sow so they shall reap. I'm predicting the right in power for the next 9 years at least after the fallout from this election. The new Parliament will have no Winston and no Greens. I feel a bit sorry for the Greens but everyone but the most blind supporter has to agree that they are no more than Helens lapdogs. Looks like its the end of Winston, and hopefully the government. Woohoo! All blog moderators with have to be on full alert: even a wounded rhino is dangerous. Why is Rodders Hide dressed like a pin-stripe pimp with a jacket too small to cover his cuffs? Is this what Cam Brewer - self-proclaimed Newmarket fashion kingpin - shouted Rodders?